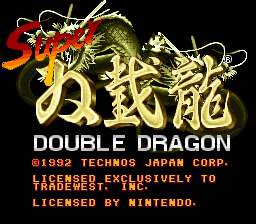 This game is the Japanese version of Super Double Dragon. It has some advantages over it’s US counterpart: Improved weapons use, Better Super kick, elongated final level, options menu but has one flaw. The music selection is mostly different than what is used in the US version, and more boring in some parts because of it. This patch restores the original music selection that you normally have in the US version, so it makes this basically a more complete game. 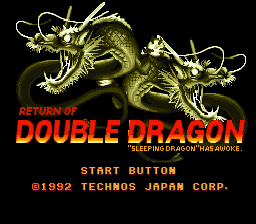 Also included is a patch if you wanna play the US version with the Double Dragon theme playing in the title screen. They play the wrong song in the US version.